George North says he will never forget the support the 'amazing' Saints fans have given him during his time at the club. The Wales wing signed off at Franklin's Gardens by helping his team to beat Worcester Warriors 32-24 last Saturday. North, who joined Saints from Scarlets in 2013, will be heading home this summer as he joins Ospreys on a National Dual Contract. 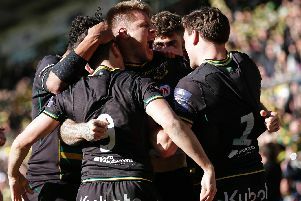 But he can exit Northampton with Premiership and Challenge Cup winners medals, having helped Saints to a sensational double during the 2013/14 season. "How do you sum up 5 seasons in a caption?!" North wrote on Instagram. "I have truly loved ever second that I’ve been in Northampton. I have met some amazing people and made some great friends. "The club and the fans are amazing, the support they’ve shown me I’ll never forget. "Thanks to the coaches, medical and S&C teams for their work. "The biggest thanks goes to the lads. Incredible players but also incredible men. A great bunch of guys and friends for life. "We’ve had some amazing memories that will stay with me forever. I wish the Saints the best of luck in the future. A huge thanks from me."